Judy Chicago includes nine ancient Egyptian female figures in The Dinner Party. She invites Hatshepsut, the only female pharaoh, as one of the thirty-nine honored guests. The names of the powerful queens Tiye, Nefertiti, and Cleopatra and of the goddesses Isis, Hathor, Neith, Tefnut, and Wadjet are written on the Heritage Floor. 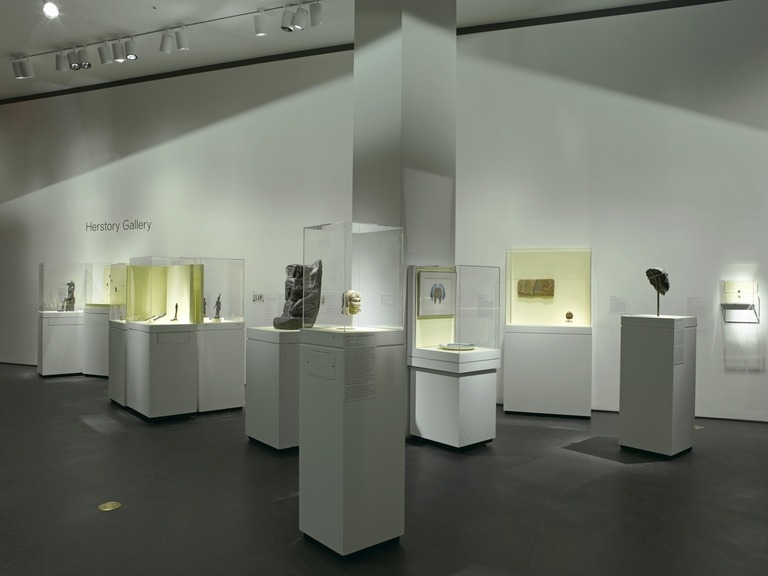 This exhibition features objects related to these figures from the Brooklyn Museum’s renowned collection of ancient Egyptian art. It also examines the impact of feminism on the modern discipline of Egyptology. Feminism has changed Egyptology considerably in the years since Judy Chicago created her famous work. Many more women are working as Egyptologists than there were at the beginning of the twentieth century. Moreover, both men and women Egyptologists today more easily accept the idea of women wielding political power in the ancient world. Old interpretations of Hatshepsut’s reign as a violation of Egyptian protocol have fallen out of favor. Today Egyptologists understand that Hatshepsut preserved her family’s claims to the throne while the male heir was still a child. Hatshepsut has been transformed from a villain to the heroine of her own story in the most recent telling. In much the same way, Egyptologists now recognize the queens Tiye and Nefertiti as their husband’s partners in ruling Egypt rather than as women who attempted to claim more power than was proper. Even Cleopatra, whose reputation among the ancient Romans as well as many modern historians was essentially negative, is today recognized primarily as the legitimate guardian of her country’s political interests. These transformations in historical reputations stem from a viewpoint highly influenced by modern feminism. Feminism has enriched our understanding of the ancient world as well as changed the world in which we live. 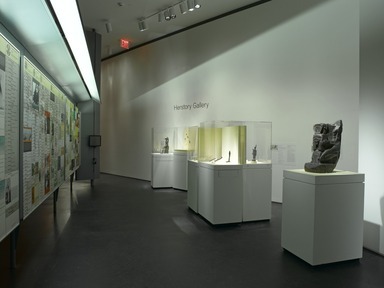 Pharaohs, Queens, and Goddesses is the first of a series of biographical shows the Center will present on an ongoing basis in tandem with its major permanent installation, Judy Chicago’s The Dinner Party. A milestone in American art, The Dinner Party is a survey of the contributions of women to Western civilization over the millennia. 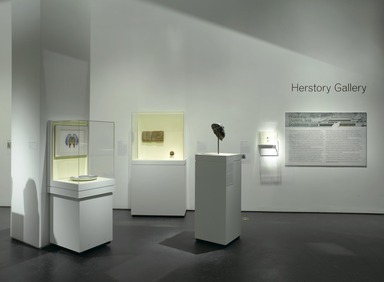 Several of the powerful women whom Chicago cites in her large-scale installation feature in this gathering of 32 portraits, statues, seals, and amulets, all portraying female figures and all drawn from the Museum’s world-renowned holdings of Egyptian art. 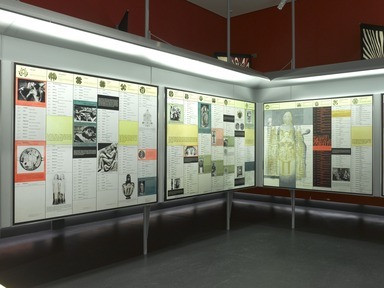 The exhibition is designed to encourage visitors to make visual and historical connections between the objects on view in the Elizabeth A. Sackler Center for Feminist Art and others that also reflect the lives of powerful women, on view in the Museum’s long-term installation, Egypt Reborn. The centerpiece of the exhibition is a black granite portrait bust of Hatshepsut in which the divine form of the pharaoh, a falcon, may be discerned in remnants of carved wings and incised feathers, still visible to one side of the head cloth. Pharaohs, Queens, and Goddesses also features one of a very small number of early representations of the female king. Although Hatshepsut usually chose to be depicted in male attire, a carnelian seal, small enough to fit in the palm of a hand, portrays her wearing both the ceremonial crown of a Pharaoh and a dress. 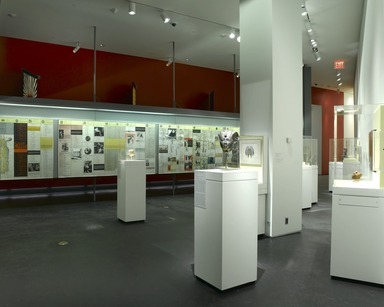 Several objects will be seen on display for the first time in many years. One is a likeness of Nefertiti, Akhenaten’s principal queen and mother of his six daughters, carved in relief on a sandstone block with two attributes usually associated only with kings: an upright cobra worn on the forehead, and the hand of the god Aten, bestowing life. The most recent of the ancient works of art on view is a marble portrait bust created sometime in the three centuries before the Christian era. The head is believed to portray Cleopatra VII, the legendary last ruler of the Ptolemaic dynasty whose life still fuels the imagination of popular culture today. Reflecting the influence of Classical art in its softened, more flesh-like forms, the portrait shows an idealized view of a ruler whose ambition is interpreted differently today than in decades past. “Today Cleopatra, whose reputation among the ancient Romans, as well as many historians since, was essentially negative, is recognized as the legitimate guardian of her country’s political interests,” says Dr. Bleiberg. 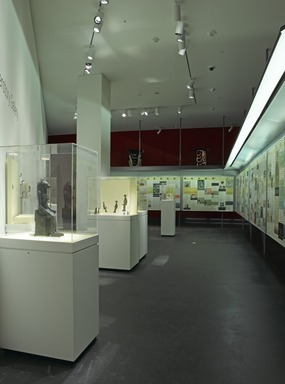 The exhibition brings to light some quite human moments, including one suggested by a reddish-brown sandstone statue of Queen Tiye, the mother of Pharaoh Akhenaten. Tiye’s political power is evident from references in diplomatic correspondence dating to her son’s reign. In one dispatch, Tushratta, the king of Mitanni, a state north of present-day Iraq, advises the young king to consult his mother if he doesn’t take his, Tushratta’s, word on a particular issue. While modern-day understanding of ancient Egyptian female rulers has changed greatly in light of feminism, interpretations have changed less in the supernatural realm, where Egyptologists were always more willing to recognize the power of women. Several objects in Pharaohs, Queens, and Goddesses depict the goddess Isis, in Egyptian mythology a single mother who raises her child until he is old enough to claim his deceased father’s throne. Worship of Isis spread throughout the Mediterranean during the Roman Empire, and the goddess is one of the powerful women whom Judy Chicago includes in The Dinner Party. Isis is represented in several objects in Pharaohs, Queens, and Goddesses, including a small bronze seated statuette showing the goddess holding Horus, her child. In another object that depicts Isis nursing Horus, the goddess wears a cow-horned crown with a sun disk that connects her to the goddess Hathor, giver of maternal milk. In turn, Hathor is seen in the exhibition in several objects. Along with Isis and Hathor, other goddesses represented in the exhibition are Wadjet of Buto, a cobra goddess already known in the first dynasty; Neith, an ancient deity of war and hunting; and Tefnut, who, as Judy Chicago recognized, represented the female principle in the creation of the earth, and was represented as a lioness and the divine eye. Pharaohs, Queens, and Goddesses: Feminism’s Impact on Egyptology will be accompanied by a series of school and public programs. 664 B.C.E. – 332 B.C.E.